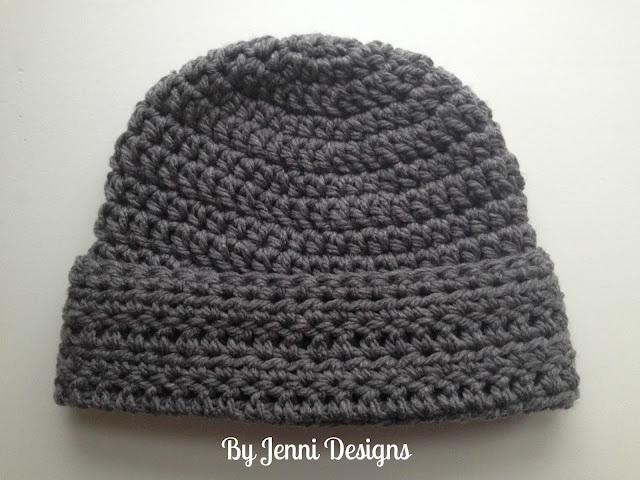 Today I have a very simple pattern to share with you, the perfect basic beanie hat for any man in your life! This pattern calls for Bernat Softee Chunky yarn and therefor works up very quickly! -Joins are made with a sl st to the first stitch made, not the ch. -The first stitch in every row is to be worked in the same space as the ch 1. Gauge: 5 hdc = 2"
Fasten off, sew in ends and fold up edge.